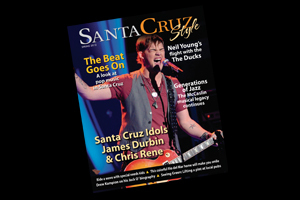 Santa Cruzans aren't content to just live a 9-to-5 existence, our magazine will take you on amazing surfing, sailing, golfing, kite-boarding and hiking adventures, giving you an inside look at our area's top sports. We'll sneak you into the kitchens of your favorite restaurants, take you behind-the-scenes at area vineyards and let you into the lives of artists and travelers. And, we'll make having fun a little easier by helping you find things like the best cruiser bike rides, great morning mochas and even what beach to visit if you're single and looking for more than just a suntan.